I love any type of What’s In My Bag posts and have done a couple in the past. I find it really interesting what other people keep in their bags and changing bags are no exception. I knew that nappies and wipes would definitely be in there but who knew just how much things you need to carry around with you! No wonder changing bags are so big. I know that as Noah gets older the contents of what I will be carrying around will no doubt change but this is what’s in my changing bag for Summer. I currently have two changing bags, a black Silver Cross one that matches our buggy and the one above which is a Storksak Tote Changing Bag. 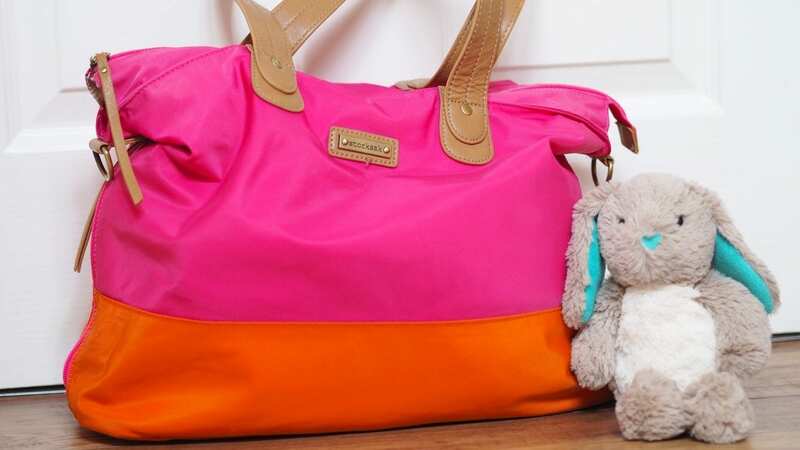 The Storksak Tote is a huge nylon bag in bright pink/orange colours and comes with a foldable changing mat. I wanted a bag that didn’t look like a changing bag but was practical too. I also wanted one that was big enough to take the 376987 things that you need to take with you when you go out with your baby. The bag is very roomy inside with a couple of deep pockets as well as a velcroed slip pocket to hold all the essential items and keep them organised. It also has a side compartment to keep your bottle insulated as well as keeping it upright to avoid leaks and spills. I don’t think it looks like a changing bag so you could use it as an everyday bag instead of taking a handbag along too. 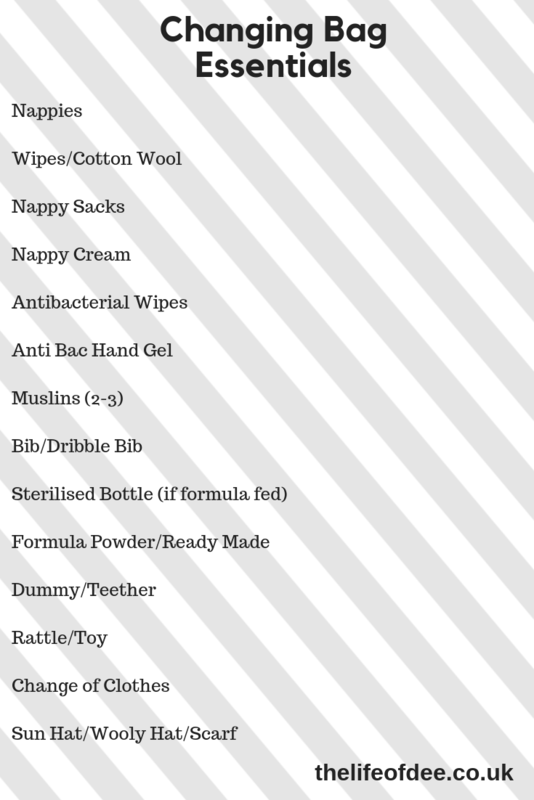 Antibacterial wipes – to clean any mess on changing tables that babies produce. I always give the tables a quick wipe with these before putting down the folding changing mat. 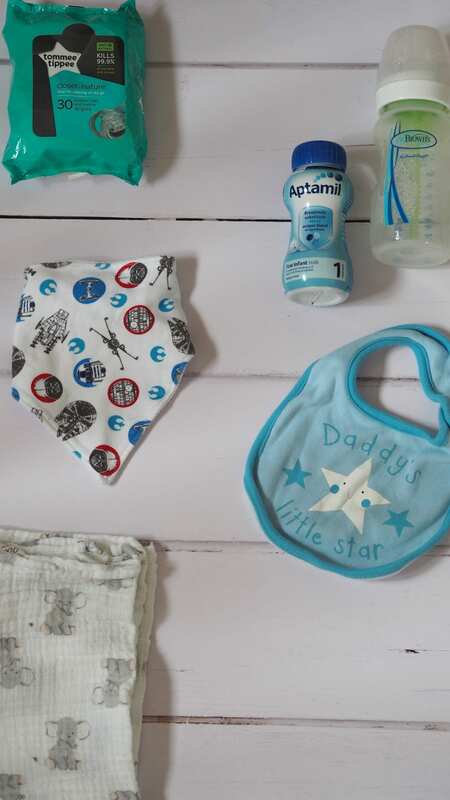 Mamia Nappies – I have used Pampers and Sainsbury’s nappies but Aldi’s are definitely the best I’ve used as well as being very well priced. They are less than £5 for 96. I only take about 3 with me now but at one point I had 6, unless you are out for the whole day you won’t need a lot with you. Water Wipes – These wipes are really gentle on the skin and are suitable to use on newborns. Nappy Sacks – I just use Tesco Value ones, I mean they are just going in the bin anyway. They come in a pack of 300 for 35p. I used to take the whole packet but I now just take a handful as you really don’t need to be carrying everything . Bepanthen Nappy Cream – I had looked online to see what was the best cream and this one came well recommended. Even my Health Visitor said that it was one of the better ones on the market. Anti-Bac Hand Sanitiser – self explanatory really. If you don’t have access to a sink after changing a nappy then baby wipes and a splash of this will help to clean your hands. Tommee Tippee Teat & Soother Wipes – in case the bottle drops while we are out, a quick wipe with one of these will help kill off any nasty bacteria. Also suitable for using with dummies. Noah will occasionally use a dummy now but used them quite often when he was a newborn. Sterilised Bottle – we use Dr Brown Anti-Colic bottles. Aptamil milk – the ready made milk is what we use for Noah as he screams really loudly and won’t wait for formula to be made up. He has never been a baby that feeds at certain times as he constantly snacks every hour. *Whispers* although we may have turned a corner this week as he has finished a full bottle at each feed and going 2-3 hours between each feed. Let’s hope this continues! Muslin cloths – these are multi purpose and I usually have 2-3 in my bag. They are useful to wipe away dribbles, clean up vomit, to use as a comforter as well as many other uses. Sun cream – Factor 50 to avoid any burns. Although it does say not to use on babies under 6 months I have used it a few times when he has been out in the buggy in case the sun gets to his face. Sunglasses – These are really cute and have an anchor pattern on them. Sun hat – to protect his little bald head, even when he is in his buggy. Spare outfit – for the inevitable poo explosion that will happen as you are out and about! I also take a resealable bag to put the mucky outfit into. Spare socks – socks are always falling off so a spare pair is a must have in your bag. 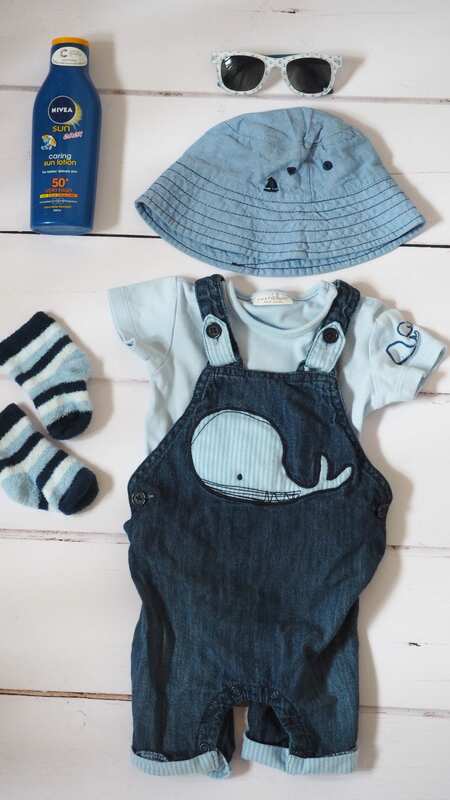 Now that Noah is a bit older he needs a few things to occupy him while we are out and about. He is happy cuddling into a muslin cloth that he uses as a comforter. I have found Aden and Anais ones really good for that as they are so soft and cute as well. They are a bit on the pricier side compared to the cheaper ones but you can definitely feel the difference. We also take out his Skip Hop Roll Around Hedgehog called Henry as he likes to grab that and put it into his mouth as well as Ben, his cuddly bunny toy his new favourite toy. 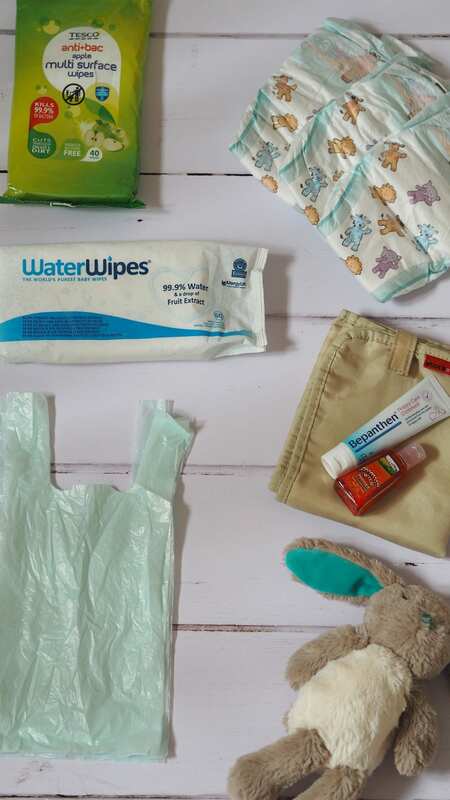 I hope that you found this post useful if you are a new mum and not sure what you need to take out with you. 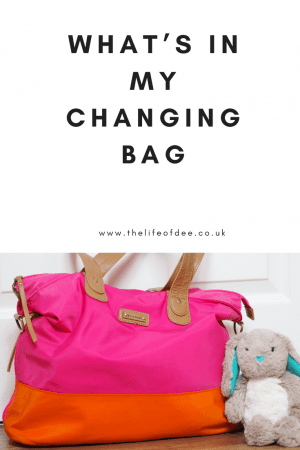 If you already have a changing bag what’s in yours? "30 Things I Love About Summer"